You do your homework on the front-end, endeavor to understand your market and competition, your internal strengths and limitations, and you implement a well-formulated strategic plan, you execute to it and ostensibly achieve success in the marketplace. Sure, at times you assess the outcomes of your strategy and modify it accordingly, but by and large the process is structured and linear. There’s only one problem with following this approach— it doesn’t work. Besides being structured and linear, it is more often than not complex, laborious and time-consuming, requiring hours, days or even months of front-end strategic planning to “get it right” from the start. It’s static and lacks agility. It’s highly assumptive and too far removed from contact with the customer. And perhaps most importantly, it doesn’t leverage failure in real-time. It doesn’t leverage experimentation and learning “on the fly”. What is needed, to be successful, is a continual process of experimentation, failure, learning and agility. It is a messy process with diversions and feedback loops, not the structured and linear process embodied in traditional strategic planning. Further, the need for experimentation over planning is greater than ever given the rapid pace of change and uncertainty in the world today. We should heed the sage counsel of Tom Peters, “Fail fast. Learn fast. Fix fast.” Or, perhaps more poignantly, the words of Mike Tyson, “Everyone has a plan ‘til they get punched in the mouth.” Everyone has a plan until they make first contact with the customer, a real, live, warm-blooded buyer who will, or will not, actually put money on the table for your product. A customer through whose “money where their mouth is” feedback you will learn what’s right and what’s wrong. Fail fast. Learn fast. Fix fast. This is so antithetical to our desire for planning and structure, but it is so spot on. Let me encourage you, if you haven’t already, to study the works of Steve Blank and other contemporary proponents of this alternative, “experimental” approach. I have included several references, below. Now what does any of this have to do with marshmallows and spaghetti? 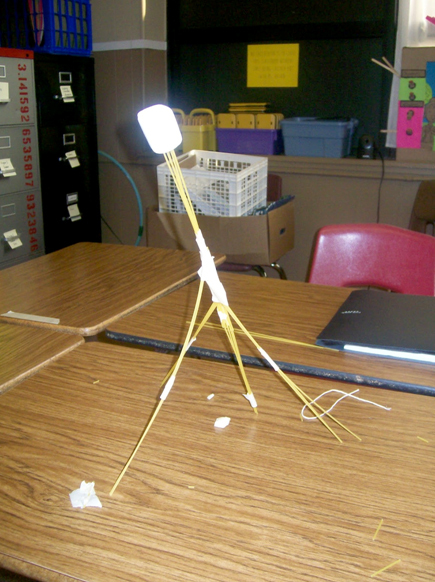 You may have heard of the Spaghetti Tower Marshmallow Challenge, an age-old team-building exercise popularized by the likes of Autodesk Fellow and TED speaker Tom Wujec and conducted in countless workshops and business conferences all over the world. The challenge is simple. Take 20 sticks of dry spaghetti, one yard of string, one yard of tape and one marshmallow. Then, in eighteen minutes, build the largest free-standing tower that will support the single marshmallow at the very top. The key is that, when all is said and done, the spindly construction of spaghetti sticks must support the marshmallow on top without collapsing. And the team that builds the tallest stable structure wins. Wujec has conducted this challenge hundreds, perhaps thousands, of times with participants ranging from MBAs and engineers to kindergartners. And his findings might surprise you. So how do you think the kindergartners fare compared to the MBAs and engineers? The kindergartners consistently outperform the MBAs. And why might this be? The MBAs, more often than not, employ a structured planning approach, deciding up-front how to design their tower for an optimal outcome, divvying up responsibilities for the various tasks at hand and executing to their plan. When the MBAs, at some point along the way, encounter a problem, it is very difficult to work backwards, along their structured, linear process, to correct mistakes. The kindergartners, on the other hand, simply start trying things, over and over, and when the next step doesn’t work they try something different. No up-front planning. No divvying up tasks. Fail fast. Learn fast. Fix fast. For those of you who are engineers, you may take some solace in knowing that, by and large, engineers perform reasonably well, better than MBAs but still not as well as kindergartners. The results of the Spaghetti Tower Marshmallow Challenge, a simple experiment that even a kindergartner can master, embody the essence of the planning fallacy and the importance of experimentation.